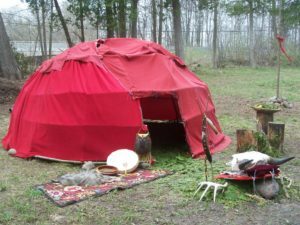 Tamare White-Wolf is the Medicine Woman Facilitating the Sweat Lodge . ~ The ceremony will start at approximately 12 pm, and will continue until approximately 6 pm. ~ Please bring something for the potluck, we will be feasting after the ceremony. Enough for 10 people. We will be in the woods without cooking facilities, so please keep this in mind when deciding what to bring. Honoring Mother Earth, Grandfather Sun & The Thunder Beings for providing this sacred meal is important and part of the experience of eating with community & family. ~ Bring tobacco so you can make proper offerings for your lessons, prayers and healing to come. Offerings can be made with Tobacco, Sage, Sweetgrass, Lavender, We have plenty of Cedar! These sacred medicines will be burned for smudge in service to Creator during the Sweat. ~ Bring talismans, crystals, sacred medicine tools, those you will bring home with your own Sacred Medicine Bundle, there’s a special place for them to recharge at the Sweat. Maybe some little gift for the medicine person facilitating the Sweat too!. ~ Clothing: sarong, shorts, bathing suit – something comfortable. ~ Bring some towels, one to wear in the lodge another to dry off afterwards. Maybe a face cloth too. ~ Bring a few bottles of water, keep yourself hydrated. ~ Please abstain from stimulants, such as alcohol and non-prescription drugs, prior to the ceremony, (Suggested 4 days). ortable.~ There will be a private area to change . ~ It is advisable to fast before the ceremony, if you don’t, please eat lightly. Eating before sweat puts a strain on the circulatory system. If you have hypoglycemia, it is advisable for you to eat a small meal, like fruits and vegetables. Muse Fest Keynote Speakers, S.E.E.D Fest, S.E.E.D. Fest Performers, S.E.E.D. Fest Workshops, Uncategorized, Workshops beltaine, beltane, creator, Druid, grandfather, grandmothers, great spirit, healing, Medicine Woman, Moon Lodge, mother earth, musefest, native spirituality, pagan, paganfest, rebirth, rebith, reborn, rebrn, Red Tent, Seedfest, shaman, soul, spirit, spiritual, Sweat Lodge, Sweatlodge, The Red Moon Lodge, transition, Wicca, Wiccan, witch, womb. permalink.